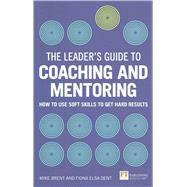 There is also a handy section on the 10 pitfalls to avoid when coaching or mentoring. Written in the no-nonsense and engaging style of the other Leader’s Guide books, this is the best tool on the market for managers wanting to coach their people to optimum performance. Mike Brent is a Client and Programme Director at Ashridge. He's worked as a management trainer and consultant with GE, HP, Ericsson, France Telecom, ICI, Volvo and Bang & Olufsen and has run seminars in Japan, China, Uzbekistan, Thailand, Malaysia, Indonesia, USA, Canada and South America. Fiona Dent is a former Director of Executive Education at Ashridge. She is currently a freelance tutor and consultant at Ashridge, teaching on a national and international basis.